15737 Patterson Road, Odessa, FL.| MLS# T3165097 | Westchase Real Estate - Westchase FL Homes For Sale - Westchase Local Experts. 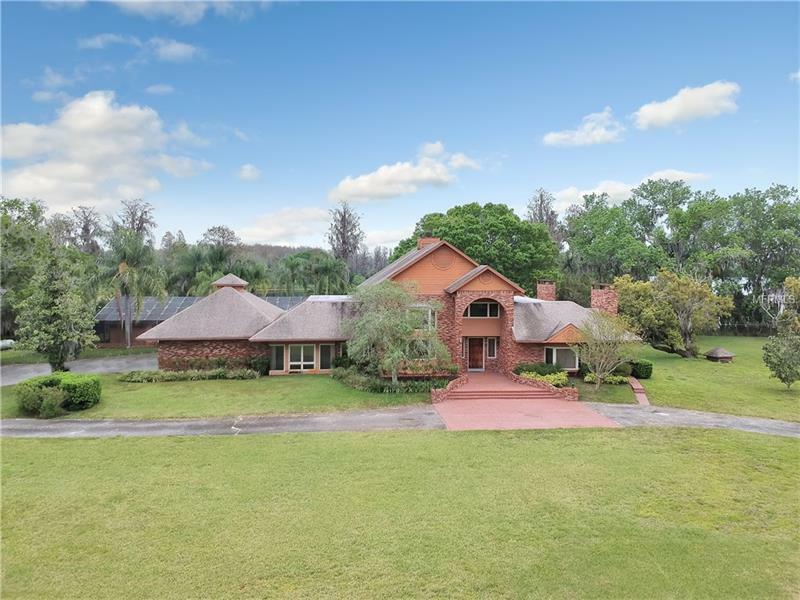 Beautiful lakefront property, with an approximately 5797 sq ft home plus an 834 sq ft detached efficiency sitting on approximately 21 acres in Northwest Hillsborough County and is set back near the lake and is surrounded by a security fence. The home is 2-story brick construction with a pristine view of Buck Lake. There is also a detached, screen-enclosed in-ground pool with an outside kitchen, a Â½ bathroom and "Floaties storage"room! The detached efficiency could be used as a guest house with a large kitchen. . The home includes a great room with cathedral ceiling, formal foyer, large living room with full wall stone fireplace and a full wall of windows and French doors that looks onto a large back patio and out to the lovely lake. There is also a formal dining room, open kitchen with eat-in brunch room, a master bedroom with fireplace and master bath and a second large bedroom that serves as an office with fireplace and full bath on the ground floor. There are 2 more roomy bedrooms upstairs with bathrooms and a craft/ bonus room with lots of lit-up shelves behind plantation shutters. There is a full laundry room with a utility sink and room to hang clothes . The 2-plus car garage has an additional storage room and a 1/2 bathroom. The home has a full home generator and is served by septic and well. The home, efficiency and other improvements are being sold "As Is" and will need some repairs, TLC and updating. This is a magnificent property on a gorgeous lake. Call for a personalized tour today.